When we first heard that an astronaut was building tech for drone pilots, we were intrigued and set them in our calendar for CES 2019. We made sure they were one of our first stops on day one of the show, and we were not disappointed. Truth is, we put little research into what Fluidity was up to. We get so many PR emails about so many revolutionary new drone accessories, we couldn’t possibly cover them all. We try. 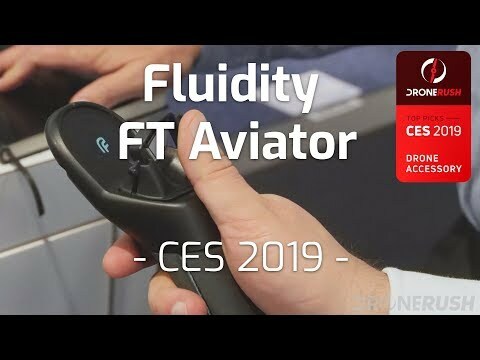 In the case of the Fluidity FT Aviator drone controller for Mavic drones, we are happy we gave them some time, and thankful they gave us some of their time. From all of the great drone accessories we encountered at CES 2019, we had to choose just one that we thought was the best. The FT Aviator stole the show in that regard. Simplicity won the day, a remote control that can be used with one hand, can control multiple different drones and is surprisingly easy to use, is a pleasure to behold. The FT Aviator was designed after the one-handed joystick control of a fighter jet. Now, if you’ve seen the cockpit of a fighter jet, that statement may have scared you. Luckily, a drone’s systems are far less complicated, and dramatically more automated. Operation is simple enough, the videogame-style remote control of the average drone offers eight inputs. The joysticks offer variable level input sensitivity, but they are still just switches. On or off. Forward, backward, left, right, spin left, spin right, up and down. That’s all there is to it, really. With the FT Aviator, you push the joystick forward for forward, pull back for backwards. Tilt to the sides to fly to the sides. Twist the stick left and right to twist the drone left and right. Finally, there is a dual action trigger, pull with your index finger to make the drone go up, push with your thumb to go back down. If that sounds at all complicated, don’t worry, it feels very natural when you put it in hand. I received no instruction before picking up the remote, and was able to immediately, successfully operate the drone in the connected flight simulator. The base of the FT Aviator is equipped with a number of buttons and dials to enhance your flight. Camera controls are the obvious additional buttons, you’ll also find a dial to control input sensitivity. Adjusting flight input is important for a balanced flight experience. The Fluidity FT Aviator is up for sale now for $299.99, this is an introductory price, it will be $449.99 soon. It is not shipping to consumers just yet. Shipping should begin in February, but we placed our order before the show closed at CES 2019. We are eager to learn more about this remote control, particularly by way of using it to fly some drones. Until then, we’ll have to live vicariously through their website. What do you think from what you see so far, is the Fluidity FT Aviator the type of remote you are interested in? CES 2019 – what’s flying this year?